The Houseboy Brigade, originally known as the Doorstep Brigade, was established in London in March, 1870, to rescue destitute or homeless boys from the street and train them in useful pursuits so that they could earn an livelihood. The Doorstep Brigade was founded by the Honourable Mrs. George Glyn (Lady Wolverton), along with a supervisory body known as the Doorstep Society. It was possibly modelled on similar association already existing in Torquay and had much in common with long-established Shoeblack Brigades that operated in London and elsewhere. A circular announcing Doorstep Society's formation stated that it proposed "to employ a band of boys, from ten years old and upwards, in the discharge of certain humble domestic duties, such as cleaning doorsteps, areas, pavements, etc., which hitherto have fallen to the lot of female servants — a custom which in large houses has its objections, and in small its hardships." The tasks undertaken by Brigade boys also extended to cleaning boots, shoes, knives and windows, running errands, and acting as pages for carriages. The boys were to be employed only for part of the day, and would be at school in the afternoon. In the evenings it was planned that rooms will be open for them for reading and recreation and on some evenings they would have the opportunity to learn trades. The Brigade, which was renamed the Houseboy Brigade in around 1875, acquired three properties which provided residential accommodation for its members. The first of these was in a group of houses at 147, 151 and 153 Ebury Street, Pimlico, with a total of 90 places. These were joined by 146-148 Marylebone Road (140 places) and 7 Church Street, Kensington (60). 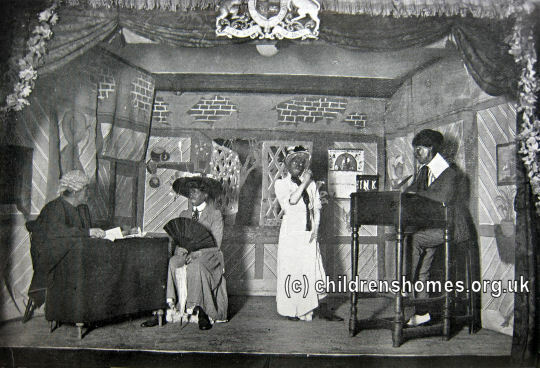 Applicants for admission were selected by the Society's Committee and as well as being orphan or destitute, were required to be in good health, not of known bad character, and have passed the Government fourth (later third) grade of education. An entrance fee of £5 (later £10) was required on admission. The boys were also required to contribute a major part of their earnings towards their board and lodging. Mrs. Brownlow told me she had experienced considerable trouble in regard to the cleaning of knives, blacking of boots, and scrubbing the front step, each servant declaring it was the other's place to do these things, until finally she had procured the services of a member of the Houseboy's Brigade, who came every morning to do this work, while once a week a larger boy from the same place washed all the windows in the house. It seemed to me most disgraceful that there should have been rioting in the kitchen over a few knives and boots. With such a small family and convenient house, three servants should have done the work easily. William Johnson, the brigade boy, came in about 7.30, and the cook, remarking that she supposed he was as hungry as usual, put a large plate of bread-and-butter and a cup of coffee before him with the knives and boots. I had seen hungry boys before, but I really never came in contact with a growing boy who had such a capacity for bread and coffee as William Johnson. In six minutes he had disposed of five large thick slices of bread and three cups of coffee. "Don't you have any breakfast before you go to work?" I asked. "Yes'um, at half-past five, but I gets hungry again," was his reply. As well as its domestic activities, the Brigade later established a printing works at 146 Marylebone Road where boys could receive training in the printing trade. 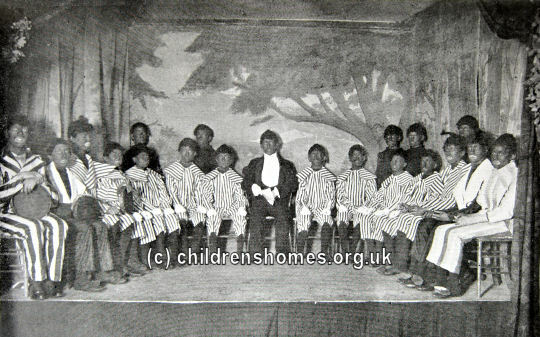 The Brigade homes provided a variety of recreational facilities for the boys including the mounting of musical and theatrical performances. In the summer, camping-based holidays were organised. The advent of the First World War seems to have led to the demise of the Brigade.